Now back in the safety of the Shire, the first things I notice are Mundo Sackville-Baggins with a quest marker over his head and an icon on the corner of my screen telling me I have mail. I decide to chat up with Mundo first to see what he has to say after all that business in Archet. He complains about the trip back home, how it could have been faster if it wasn't for me slowing the group down, blah, blah. This also happens to actually finish the intro quest lines, rewarding me with the Return Home spell and a passive buff called "Novice". I am not too sure what that does. The description only says "You have been acknowledged as someone who could one day influence the fate of Midle-Earth." The second thing he says, is a new quest, one that starts an epic quest line for vol. 1. In this case for the prologue. Let me go into a bit of a tangent here to try (since I am going by my understanding of it) to explain the epic quest line thingummy in LotRO. See, these epic quest lines are like the chapters in the books. In this case, the prologue, with each race having their own prologue. Anyway, the difference here is that unlike in the books we are not the main heroes who will save Middle-Earth from the evilness of Sauron. Instead the players are more like unsung heroes. They are the ones who fight so there will be a place that the book's Fellowship may return to once their journey is over. They are the ones who fight so the Fellowship doesn't get overwhelmed by the forces of the Enemy during their perilous travels. They are the anonymous people that, at least in this version of the story, sacrifice themselves so the book's Fellowship can get to Mordor to destroy the One Ring. Yeah, it is not a very glamorous job but someone has to do it. Anyway, back to Mundo... The new quest he offers is basically a lot of more whining. This time however he even went so far as to write it in a letter that he wants you to deliver it to the mayor. As you can imagine the letter is a bunch of complaining about his abduction as well as demands for material compensation for all that he suffered. Since shoving the letter down Mundo's throat isn't an option I accept the quest then go back to my own business, getting a few more quests along the way. I also take the time to check what that received mail was about. Turns out it is a letter from Jon Brackenbuck. In it he basically thanks me for the help back in Archet as well as sending a few things he was able to collect from the villagers as a thank you gift. Now, that thank you gift is an actual gift pack you receive and can click on your inventory. The one I just received requires level 5 to open. I am already level 6 so this is no problem for me. Opening the gift pack gives me a temporary horse whistle (a horse I can only use for 24 hours in real time), 3 Tier 1 Morale Potions (Morale is the equivalent of HP in LotRO), 3 Tier 1 Power Potions (like Mana in other games), a letter that starts a quest directing me to the closest place where I can learn how to craft, 2 navy dies, a letter of commendation from Jon Brackenbook that starts another quest with a reward of 5 Tokens of Salutations (basically an in-game token coin to buy stuff from specific vendors), a "Gift for a Starting Adventure" which is basically a gift-pack but that requires level 6. I then open the "Gift for a Starting Adventure". With it I get a "Writ of Special Passage: 1 hour" (unlocks all travel locations regardless if I have been there or not for 1 hour real time), a "10% Run Speed Boost (30 Min)", 2 "Regenerative Foods (tier 1)" and a "Gift for an Adventurer" which is, again, a gift-pack, this time requiring level 7. This is another time for a side note. The gift-pack is another thing about LotRO that I find very neat. See, those potions, dyes, temporary horse, etc. are stuff that you could buy in the LoTRO store. This allows you to get a taste of that stuff without having to spend your hard-earned money on it without having any idea of what you are actually getting. It is also a nice token of appreciation towards their customers. This is also the reason I decided to list the stuff I bought stuff off the LotRO store. This way it can be easier (at least for me) to track what items I used were from the store and which ones came from these gift-packs. To be honest, I am not sure how common this is among free to play MMORPGs. The only other one who does something like that, from the top of my mind, is Runes of Magic. There are probably others I played but can't remember it now. Runes of Magic was just the one where I saw it first. Alright back to our story. Or whatever I can pass as story for this series. My first quest is to do some mail delivery from Little Delving to Michel Delving. I guess the hobbits are lacking people to do the mail delivery if they are trusting a complete stranger to do it. Anyway, the idea of the quest is to get a bundle of mail from a table near the NPC and then go deliver it to the next postmaster, all the while avoiding nosey hobbits along the way. It isn't that bad of a quest, specially because the nosey hobbits appear on your mini-map as with an eye icon. So you can plan your route. It also helps that you get a 120% run speed boost while carrying the mail. The other reason I am mentioning this is if you complete all the mail delivering quests, you get a deed for it. That deed will award you a Virtue (think of it as a passive buff that you can "equip") and 5 Turbine Points. Delivering mail may not be glorious but it awards Turbine Points! If you notice in the screenshot there is also another deed that can be completed on this area too. It is called "The Life of a Bounder". 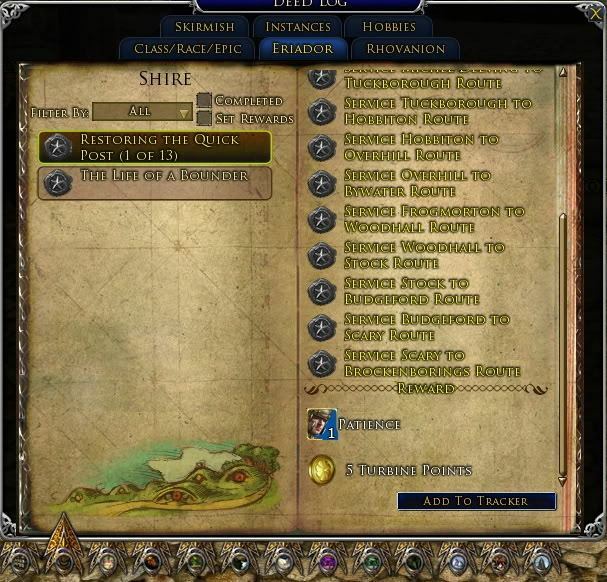 The requirements are to complete quests within the Shire. The reward is another Virtue and 10 Turbine Points. Shire Quests: Gotta do'em all! With the first mail bag delivered it is time to get back to business. First thing first is delivering Mundo's letter to the mayor Will Whitfoot. Obviously, the mayor isn't all too happy with the letter. He flat-out refuses, with reason, to pay for something that he absolutely has nothing to do about. His request is to go tell this to Lobelia Sackville-Baggins. Why not go back and tell this to Mundo since he was the one wrote the letter? I don't know. Your guess is as good as mine! With that done I turn in another quest near there, which sees me joining the Bounders, and get a few more quests. The quests are pretty varied, they include but aren't limited to, investigating the disappearance of some money reserved for refurbishing the Town Hole, helping someone find a drink family recipe to win a competition, helping someone else with a Hide-and-Seek game and so on. While in the middle of questing I decided to get started on crafting too. Crafting in LotRO works the following way, you choose a Vocation, which is a bundle of 3 related crafting professions. For example, the Armsman vocation will give you the Weaponsmith crafting profession to craft the metal weapons, the prospector profession to harvest the ores and the woodworker prospector to craft the wood weapons. You can only have one vocation at a time and if you notice in the example above there will be one crafting profession that will require to get materials from other players or an alt that can harvest the materials. Besides that everything is pretty much the same as in any other MMORPGs. Gather the materials, craft stuff, rinse and repeat until you can get more recipes to craft more stuff which requires different materials. I was in doubt between the Explorer craft vocation which would allow me to tailor my own armor as well as harvest a few other resources for trading. Or the Tinker craft vocation which covers the making of jewellery and cooking. The second one would be me for amusing reasons. After all, Basilio is a burglar and a hobbit. So it would fit for him to be interested in the makings of shiny things as well as cooking. The first option would be a more practical one though. As a Burglar I wear leather amor this would allow me to make any armor I may need. In the end I decided to go with Explorer since being limited to TPs earned only through gameplay imposes its own challenges as it is. With that settled it was time to go back to questing. People were found (for a hide and seek game! ), chickens were saved, wolves were slayed a few more bundles of mail were delivered (though still a lot more to go) and level 8 was reached. Unfortunately that was all I was able to accomplish during this game session. No TP to show off this time. Though next post there should be some. P.S. : If you are wondering where Basilio's name comes from, it is the name from a book called "Primo Basílio" (Cousin Basilio) by the portuguese writer Eça de Queirós. It is one of those books that teachers tell you to read during high school but nobody really likes it. The only thing about it that stuck to me during all those years has been only the title and some vague memories about the plot. The one who lead the attack on Archet wasn't a local Blackwold leader (at least I don't think he was) but by Calder Cob, one of the guards. I did find out earlier he was helping the bandits because he tried to make a setup to kill me. Unfortunately to him, I lived and he just bragged how it didn't matter as the guard captain would never believe my word. What with Cob being the most trusted guard and whatnot. Unfortunately, to me and the people or Archet, he was right. The guard captain didn't believe me until I found some other proof of what was going on. By then it was already too late. The mysterious robed men were actually Cargûls. No it is not a typo. No I don't know exactly what they are either. Probably a gimped version of the Nazgûl made just for LotRO just so the players can have something similar to kill at a certain point in their adventuring life. You might be wondering why I didn't write things this way in the first place. Well, you see I was trying to avoid spoilers as much as possible and then only realised how silly that was this morning. I mean, I had already spoiled pretty much all the other important bits anyway. There was no point in trying to avoid spoiling those. So, corrections made, typos fixed. I will just chalk that as blogging growing pains. Which will probably last forever. But that is detail. Previous article:The LotRO Experiment – Part 1: One dagger to stab them all! 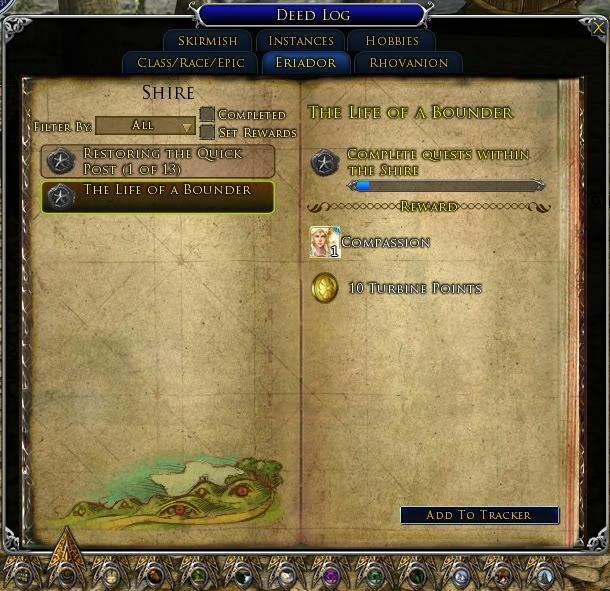 Next article:The LotRO Experiment Part 3: I’m rich! I’m rich! … Ok, I am not. Yeah, I wasn't expecting anyone that reads this blog to have read any Portuguese books in school. Or even have read that book at all. What I meant was that high school teachers everywhere have a book that they find culturally relevant/good teaching material and asks the students to read it. In Brazilian schools, that is one of the books. Or at least it was during my time.